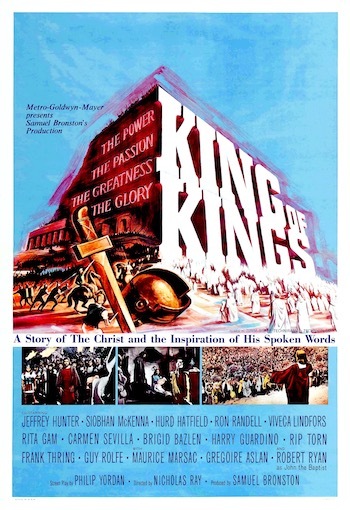 As soon as King of Kings began, I felt my heart race and my left arm go numb when the narrator (Orson Welles) intoned that the year is 63 B.C. Maybe I don’t know a whole lot about this religious stuff, but I was smart enough to notice that we were starting things way before Jesus was ever immaculately conceived, let alone bugging Romans. I wondered just how much pre-game hype I was going to have to sit through. After all, I was paying to see a film about Christ and his times, not about how crappy everyone had it until he showed up. Once we’ve seen a few battles between the Romans and the Jews though, we go to Bethlehem where there’s no room at the Inn. I may be ignorant of most of this New Testament jibber jabber, but this part of the story I had heard about through a variety of Christmas cartoons. But what of the Roman power structure that controlled the Jews? Mainly you get to see Herodias, the man who would rule that part of the Roman empire for Caesar. Herodias embodies all the decadence that Jesus opposed. Herodias ascends to the throne after killing his old man and has a wife which he apparently stole from his brother off-screen. There is also a daughter of some type named Salome who Herodias looks like he’s having a relationship with. Salome is of course corrupted beyond all belief by this environment and controls Herodias the only way broads control any of us men – with her dirty dancing! It’s through this dancing that she makes Herodias give her anything she wants. In this case, she demands the head of John the Baptist! John the who? What happened to Jesus? Okay, a funny thing about this movie is that Jesus seems to disappear from the script for vast amounts of time, leaving things in the hands of such secondary characters as this John guy and another dude named Barabbas. Barabbas? Yeah, he actually got his own biblical epic starring Anthony Quinn, but in this film he’s played by Dirty Harry’s Harry Guardino. The emphasis on Barabbas is an example of how the movie tries to have this sweeping scope, but sacrifices any kind of focus by doing that. The movie goes on to detail John the Baptist’s efforts to preach the coming of the Messiah. Once Jesus shows up, John recognizes him as the Messiah and these two have some nice scenes together. John baptizing Christ and Christ coming to see John who has been imprisoned by the Romans for pretty much calling them out for the sick, twisted freaks they are, give this movie a much needed sense of humanity. As Jesus’ notoriety grows, it is all played out against the backdrop of unrest, where Barabbas is fomenting some type of revolt. His buddy Judas has decided that Jesus is the way to go and has left Barabbas to be among Jesus’ disciples. Judas eventually betrays Jesus and rats him out to the Romans, but it seemed to me that he didn’t do it because he wanted them to destroy Jesus, so much as because he thought that once Jesus was jailed, he would use his powers to wipe out the Romans. For a movie that wanted to make all these events a spectacle, Christ’s crucifixion and his resurrection are portrayed with restraint and these scenes seem to be a bit abbreviated considering all the time that was spent on stuff like Barabbas getting his army together and John haranguing Salome. The time on the cross, his appearance to Magdalene, and his final appearance to his disciples fills the last five minutes of the movie. Even Jesus dragging the cross through the streets seems underdeveloped, his journey taking about 20 steps before they cut to the crucifixion. As far as he was allowed to, Jeffrey Hunter did a good job of bringing the role of Jesus to the big screen. Some might whine that his Jesus is a bit too close to a male model, but there is an authority in his portrayal that you see in scenes like the impressive Sermon on the Mount and when he is on trial for his life. Whenever Hunter’s on screen, he’s magnetic in conveying his character’s calmness and wisdom, but he simply isn’t on screen enough. Characters like John the Baptist and Barabbas came off like refugees from a Hercules movie and did little but slow things down. The movie wants to be about the King of Kings, but the flabby script makes it more about the King of Kings and all his friends, enemies, associates and every other historical character (real or made up) who they could stick in there. The story of Jesus could make a powerful and moving motion picture and this one does have its moments, but too often it veers off course and pushes lame characters to the forefront leaving Jesus missing in action.